RIO DE JANEIRO, BRAZIL – The first census undertaken in the Complexo da Maré has shown a growing local economy with 3,000 businesses providing income for 9,000 residents. The findings will be showcased at a meeting focused on entrepreneurship to be held at the complex. Businesses in Complexo da Maré employ 9,000 people, most of whom live in the favela, image by Espocc Mare/FLickr Creative Commons License. The research will be published today (July 24) and discussed at the first Seminário de Empreendedores da Maré (Entprenuers of the Maré Seminar), an organized by the non-governmental organization (NGOs) Observatório de Favelas that undertook the study. The event will take place at the Arts Center, and will introduce local entrepreneurs to discuss the profile of their businesses, the possibilities of community support and how local enterprise can help meet the wider community’s needs. “The research shows the possibility of generating opportunities for those who live there. It shows that the Maré has a potent economic structure, employing local labor, catering to customers and using local suppliers,” said Dalcio Gonçalves, who works for Observatório de Favelas and was one of the research coordinators. The favela community complex was last in the international media when the federal military and local police forces occupied the area in the months leading up to the World Cup. Police have been moving to “pacify” the area for years, yet the Police Pacification Unit (UPP) program has struggled to make the progress they have reported elsewhere in the city. 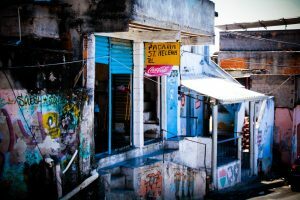 These findings show a more positive side to life in Complexo da Maré, which the census found is home to 130,000 people. On average, local establishments employ 2.94 people, and, according to Gonçalves, 76 percent of workers live in the Maré itself. The study accounted for every type of service or trade from fixed developments, stalls, shops and work done in the home. Illicit services such as the sale of pirate media or products, were excluded. The economic leaders in the community are reported as bars and restaurants, followed by beauty salons and barber shops, then clothing. Gonçalves puts the popularity of bars down to the cramped living conditions of homes. He said that that people prefer to socialize outside of their houses and this led for a demand for meeting places. He also said that the lack of cultural facilities, such as cinemas and theaters were also factors in the increasing the dominance of bars. The census also found that business owners expressed a need to have access to banking services. The absence of bank branches in the complex led to practical issues and the lack of information about financial instruments and processes also affects their business. Your headline is inaccurate (or your article left out key pieces of information). What the census shows is some amount of economic activity. “Growth” would indicate that there was some previous reference point at which there was less economic activity.